As the years have passed, has the skin on your face become looser, resulting in unwanted sagging and wrinkles? Do you have excess tissue in your neck and lower face that you simply can’t slim down, no matter how much you diet and exercise? If you wish you could return your skin to a tight, youthful appearance, but do not want to take weeks off work, or undergo an involved surgical procedure, you are in luck: we are proud to offer our patients FaceTite, a minimally-invasive solution to skin sagging and the stubborn pockets of fat that are making you look older than you feel. FaceTite will eliminate fat, tighten loose skin, and stimulate your collagen production, as well as achieve a more youthful, attractive contour of your facial features. If you are interested in learning more about how FaceTite can take years off your appearance with a single convenient, comfortable procedure treatment, call Dr. Brown’s office today to schedule a complimentary consultation. 6 What Should I Expect During My Recovery From FaceTite? FaceTite is the minimally-invasive version of a facelift: it is a safe, effective way to improve skin elasticity and eliminate stubborn fat deposits that commonly develop in our face and neck as we get older. A FaceTite procedure is performed with an easy-to-handle wand. A tiny hole is made in the patient’s skin to allow the slim FaceTite cannula under the patient’s dermis. This enables your surgeon to access your underlying skin tissue and fat pockets while minimizing any strain on your body. The computer-assisted FaceTite system will administer monitored radiofrequency energy from the slim cannula to the portion of the wand which remains outside of the patient’s skin, parallel to the cannula. By measuring skin and fat temperature in real time, the FaceTite handpiece will deliver the safe, exact level of radiofrequency energy required to stimulate skin tightening, induce fat cell death, and recontour your features into a more firm, youthful appearance. FaceTite requires minimal downtime. The convenient procedure and recovery make FaceTite an ideal choice for patients who want to combat their signs of facial aging. The results are not only impressive, but they can also last up to five years! Eliminates fat and excess tissue, without a traumatic procedure, like a facelift. FaceTite will liquify and gently extract your fat. Due to the strategic use of radiofrequency energy and the slim FaceTite cannula, this procedure eliminates fat more effectively than other low-stress procedures, like CoolSculpting. Controlled contour. The easy-to-handle FaceTite wand and monitored temperature levels allow your surgeon to contour your jawline and features into a natural, balanced, and firmer position. The computer-controlled system guarantees the uniform, smooth tightening, and contouring. A pain-free procedure. Patients are kept comfortable with local anesthetic. A comfortable, short recovery. The radiofrequency energy will melt your fat, but also coagulate your surrounding blood vessels. This will greatly reduce bruising. You will see optimum results while experiencing minimal strain on your body. Patients can usually return to work within a week. Immediate results. The skin tightening your FaceTite achieves will be immediately visible. Healthier, firmer skin. Due to the fact that the thermal energy will stimulate your skin’s collagen production, which slows naturally in our bodies with age, you will notice that your skin is firmer and healthier-looking within three to six weeks. This will add youthful volume and maintain the tighter contour achieved during your procedure. Good candidates for FaceTite are those who have loose, sagging skin on their brows, in their cheeks, around their mouths, or along their jawlines. Patients who are considering a facelift, but do not wish to undergo a surgical rejuvenation yet, are good candidates for FaceTite, depending on the severity of their wrinkles and skin laxity. Ideal patients are in overall good health, are non-smokers, and have a positive, open outlook towards the results that are achievable with a facial rejuvenation procedure. Patients who are experiencing skin sagging and stubborn tissue deposits on their body may additionally be good candidates for the gentle, impressive tightening of a BodyTite procedure. If you think you may be interested in learning more about BodyTite, notify Dr. Brown during your complimentary consultation. Dr. Brown invites men and women who are interested in restoring their face and neck to a more youthful position to visit his office for a complimentary consultation. During your consultation, Dr. Brown will examine your skin, as well as discuss your medical history and goals for appearance. He will make sure to answer all your questions about FaceTite and any other skin tightening procedures he thinks you may be a good candidate for, like BodyTite. After he has a good understanding of your desired outcomes, he will work with you to create a FaceTite treatment plan that will best compliment and restore your natural vitality. No two patients are the same. When considering a cosmetic procedure, it is important to pick a doctor who has both the level of skill and attention to detail necessary to give you the best outcomes possible. 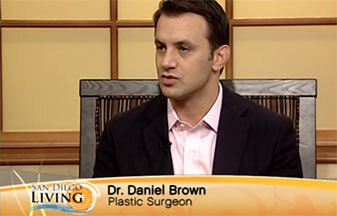 Dr. Brown is happy to meet with you and help you feel more comfortable with your skin tightening options. If you are interested in learning more about FaceTite, or any other skin rejuvenation procedure, call our office at (619) 461-1500 today to schedule your consultation. Patients receive their FaceTite treatment under local anesthetic. A miniscule hole is made in the patients’ skin, behind their jaw, to allow the FaceTite cannula to glide safely through a patient’s facial tissue. This cannula will emit radiofrequency energy to the targeted areas of skin, as well as to the arm of the FaceTite which runs parallel to the cannula, on the surface of the skin. A computer will monitor the skin temperature to guarantee that the skin will be heated to the degree required for skin tightening. This encourages safe, even tightening and contouring. The wand and cannula will achieve a youthful facial contour overall, as well as eliminate stubborn areas of fat. The cannula, thanks to the gentle radiofrequency waves, will gently melt and extract unwanted fat. In addition to the tightening of both the epidermis and deeper skin structure, the procedure will stimulate the production of collagen in patients’ skin. This will encourage a firmer, more full and youthful skin condition that will last for months to come. One treatment of FaceTite is usually enough to achieve impressive, long-term rejuvenation. If you have more questions about FaceTite’s comfortable treatment and major results, call Dr. Brown’s office to schedule your complimentary consultation today. What Should I Expect During My Recovery From FaceTite? While patients will experience minimal discomfort during their recovery from their FaceTite procedure, most patients decide to take a week off from work due to swelling in the treated area. Swelling on average diminishes within five to seven days. Patients rarely experience bruising after their FaceTite procedure, due to the fact that the cannula safely cauterizes any blood vessels that the FaceTite wand encounters. You may be instructed to wear a compression garment following your procedure. You will receive personalized instructions regarding the use of your compression garment, as well as any details that will be relevant to your FaceTite and any other complementary procedures you may have received. If you have any questions during your recovery following your FaceTite treatment, give us a call: Dr. Brown and his helpful staff will be happy to answer them for you! Reduced sensation may occur in some of the treated areas, but sensation will return in the weeks following your treatment. A FaceTite treatment will return your skin to a tighter, more youthful position. Your treated area will be slimmer and smoother-looking, thanks to the safe, even elimination of unwanted tissue and the improved laxity of your skin. The procedure will also stimulate your own body’s collagen production. Due to the fact that collagen production occurs in the deep dermis, it will take roughly three to six weeks before you observe your skin has more volume and is better supported. Any dissolved fat that was not removed during the procedure will be naturally eliminated from the body in the weeks following your FaceTite. This, combined with the healthier presence of collagen in your skin, means that the contour of your results will continue to improve for six months following your skin tightening treatment. FaceTite, without leaving any scars, achieves impressive results comparable to a mini facelift, an invasive surgical procedure. The outcomes of your FaceTite will last up to 5 years! The cost of a patient’s FaceTite will depend on the area or areas which they would like to slim and contour, as well as the degree of work required to achieve their desired results. Once a patient completes their consultation with Dr. Brown, he will create a treatment plan which will achieve the best outcomes for the individual patient. Patients will receive a cost breakdown based on this unique plan. Has your skin started to sag? Have you been unable to slim your face or jawline, no matter how much you diet and exercise? FaceTite may be the comfortable, effective treatment you’ve been looking for! If you are interested in learning more about FaceTite, call Dr. Brown’s office to schedule a complimentary consultation today.